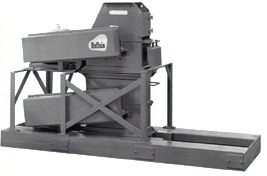 Fine Grinding Pulverizers available in two styles. Ideal for processing abrasive materials to a fine powder in a single pass. Ideal for fine grinding of hard, blocky materials ... no need for a pre-grinder. Achieve fine grinds without continual screen replacements. Much lower horsepower requirements than other types of fine grinders. Ruggedly built to stand up to severe applications. USER FRIENDLY: Mill is designed for ease of operation, and easy of maintenance. Available with conventional or stirrup style hammers, and a variety of screen types and sizes. 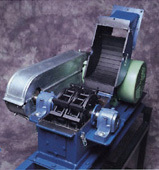 "J" Series fine grinder for further processing of granular or powdered materials. Single stage, low cost mill employs wide "stirrup" hammers or powder materials. Replaceable, ribbed linear plates assist in product breakdown. Available with a wide array of custom components such as screw feeders, variable speed drives, and numerous feed and discharge hopper styles. Screen change out can be accomplished in minutes without removal of mill top. Welded fabrication of mill housing allows for custom sizing of the mill to the application, as opposed to conventional cast housing which limits selection.